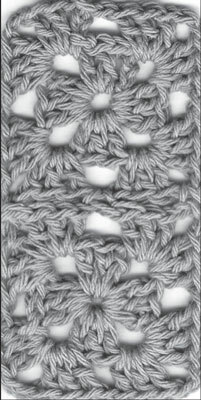 Some crochet pieces are joined together while working the last row or round. Joining pieces as you go saves you from the daunting task of having to sew or crochet lots (and lots!) of pieces together at the end of a project. Motifs that have side edges, like squares or triangles, are usually joined along one or more sides. Motifs with points (think flowers and stars) are joined at one or more points. Note: The pattern you’re working should let you know exactly where to place your joining stitches. If not, just refer to the guidelines here. Work the first granny square completely and fasten off. Work the next square until you reach the point where you want to join the 2 pieces together. This point is usually a corner stitch or chain space. Work the corner stitch or chain for the square you’re currently on. Holding the 2 pieces with wrong sides together, insert your hook from the back of the current square into the same corner stitch or space of the square you completed in Step 1. Yarn over and draw your hook through the corner stitch, or space, and the stitch on your hook, as shown here. Joining pieces on the last round. You now have a slip stitch seam at the corner. Continue working the stitches across the side of the square, joining stitches or spaces as directed. Finish the square you’re working on to the end of the round and fasten off; weave in any loose ends using a yarn needle. Continue working any remaining motifs the same way. To see what 2 pieces joined together on the last round look like, see the following figure. A seam created by joining two pieces on the last round. If you’re working a row of squares, like for a scarf, you have to join squares on only one side. 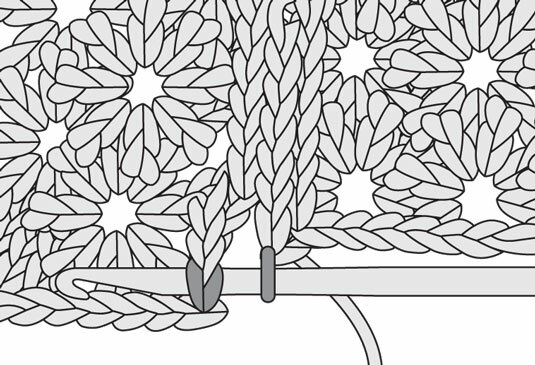 If you’re working a blanket or a shawl, however, you need to join the pieces together on more than one side. Blanket and shawl designs often consist of several rows containing a number of motifs that must be joined, which is why you join them on more than one side.